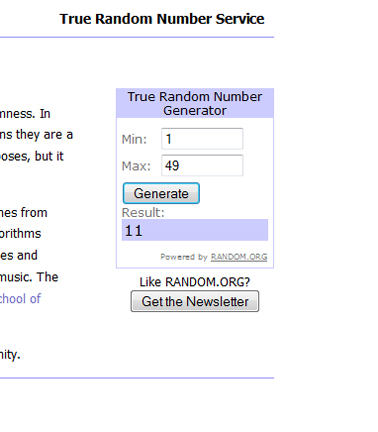 Congratulations to Sandra as number 11 was drawn by the random number generator!! 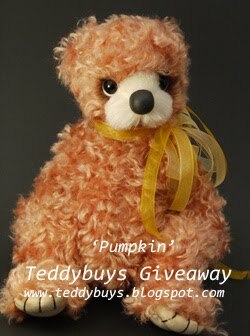 Please email me with your address and I will get Pumpkin into the post asap! Today is a special day for me as it is my mother's birthday. 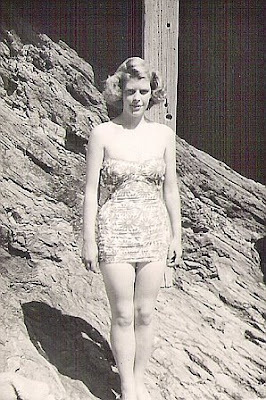 She passed away five years ago, but would have been 79 today. Love you Mum. Free Giveaway Draw is Tomorrow! The draw for Pumpkin is tomorrow, the 31st October. To have a chance of winning Pumpkin, add a comment to my blog and become a follower or add yourself to my mailing list, whichever you prefer. I will post Pumpkin anywhere worldwide. The draw will take place at 6pm UK time (as I am back to school tomorrow). Good luck all! 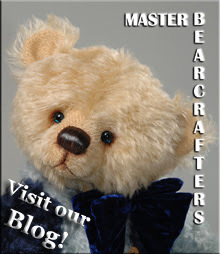 I am very busy preparing bears for the Teddies Worldwide Christmas Treasures online show. The preview for the show begins on the 4th November. Visitors to the preview will be able to vote for their favourite bear. The show, itself, begins on the 18th. November. I will post again tomorrow evening, with the winner's name. I'm very, very busy bear and ellie making for the Christmas Treasures online show and the British Bear Show - both coming up next month. I have been developing new ways of working and although this process is very exciting for me, as I love finding new looks and methods, it plays havoc with deadlines that need to be met. 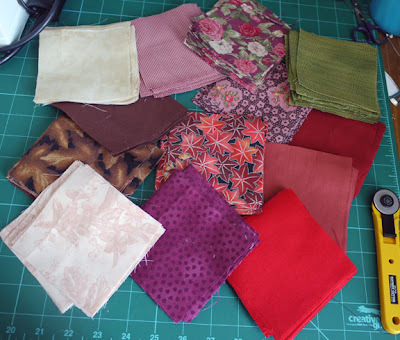 I decided about a month ago that I should make a patchwork quilt for our king size bed. 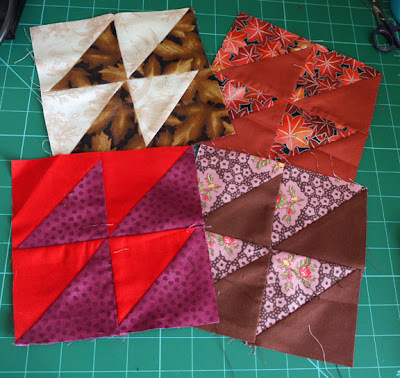 I have done a small amount of hand piecing - about 30 years ago, but have never tried patchwork on the machine. 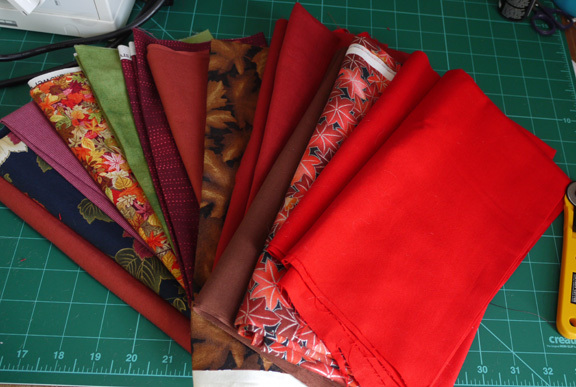 I have been accumulating fabrics with autumnal colourings, as I love the rich colours of this time of the year. I am very happy with the fabrics, but worry how they will look together. 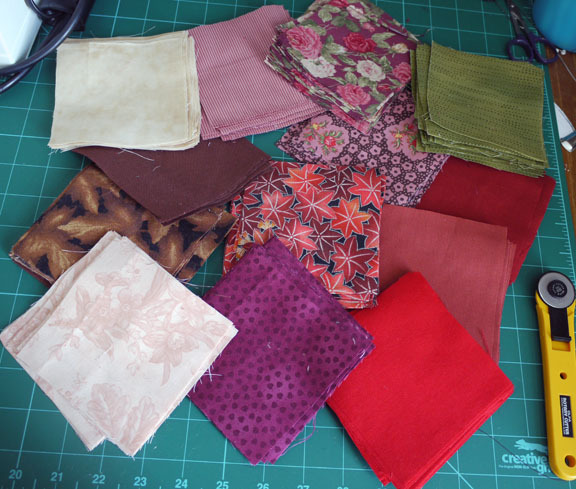 Maybe for a first project, I should have gone for charm packs (where all the fabrics are designed to coordinate). Unfortunately, I am too pig-headed to go for the sensible option, so will have to live with the choices I have made. I have my squares cut out and have pieced four squares, but will now need to put this aside until after the two November shows. Hopefully, it will be a project I will be able to complete over the Christmas holiday. I went to the Knit and Stitch Show at Alexandra Palace earlier this month. WOW! I had no idea there were so many wonderful materials to be found available in the UK. If you ever get the chance to go, it is well worth it if you love textiles in all their forms. I went on a Saturday and it was incredibly busy - several areas were 'gridlocked' with people; not ideal if you are a claustrophobic! I have been toying with the idea of getting an embellisher machine over the past month or so and decided to go for it while I still have a salary coming in. 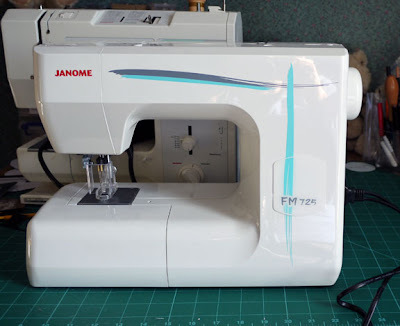 I spent a lot of time looking at different models and, in the end, went for the Janome FM725. This comes with a five needle and one needle head. I also bought an additional head that allows you to change the size of the needles. I had a little play with it last night and am really pleased with it. All I need now is the time to learn to exploit it's possibilities! It's not too late to enter for the draw to win Pumpkin. The draw will be on the 31st October.